If you consider yourself a real traveler who enjoys going out for longer trips with your truck, you might find yourself wondering the best options for sleeping in your truck. 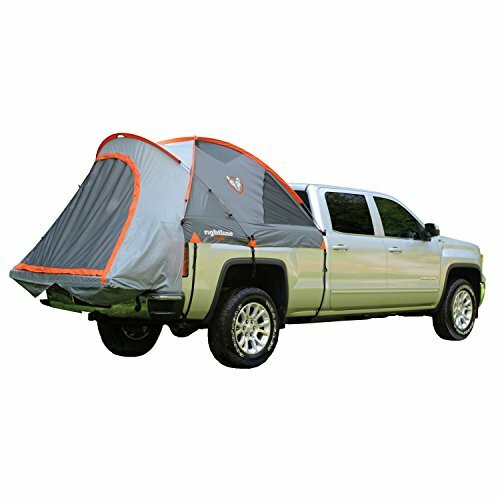 Bed tents offer a versatile solution for pickup owners that can to turn their vehicle into a mobile home in an instant. It also gives you the flexibility to rest or stop to enjoy the view - whenever and wherever they wish. Choosing the best truck bed tent will help you enjoy the experience even more. So, let's check out the options that are available. Napier's truck bed tent can be easily set up in the back of your pickup, granting you a comfortable space that can accommodate up to two people and a standard bed. 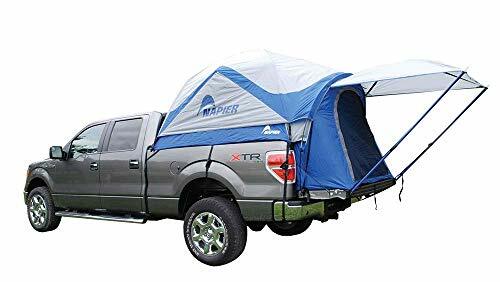 If this isn’t convincing enough, this pickup bed tent comes with a sewn-in floor, with 4 large windows and a large entrance door equipped with a storm flat. Furthermore, the 5.5" vertical height will provide you with more than enough space. To assemble it you will only need to use the 4 shock-corded fiberglass poles included in the package. On Amazon, Napier's travel solution is currently the most successful one promising to fit most standard pickups and satisfy all your camping needs. Rightline's tent for truck beds offers you a floorless design, making the setup even easier. You won't have to remove any gear from the bed before starting to set up your new pickup bed tent. The heavy duty straps and the nylon buckles provide safety against damaging your truck's finish, and the color coded poles make assembly a breeze. Rightline's truck bed tent provides comfortable space for 2 adults, has a sky view vent for more light and view, and is made of water resistant fabric. To top it off, you get a stuff sack and a choice from 5 different sizes and 6 different styles. Guide Gear's pickup bed tent delivers an easy-to-use, lightweight solution for camping enthusiasts, which can be assembled in only 10 minutes. Fitting most 72-72" beds and full-sized pickups, you can simply turn your truck into an instant mobile home in no time. However, for better weather resistance, you should consider getting the optional rain fly that will give you extra weather protection. The package also contains a heavy-duty, weather-resistant polyester carrying bag for storing the tent. The large D-shaped door and the mash windows will provide enough ventilation, while your comfort is ensured by a sewn-in floor. 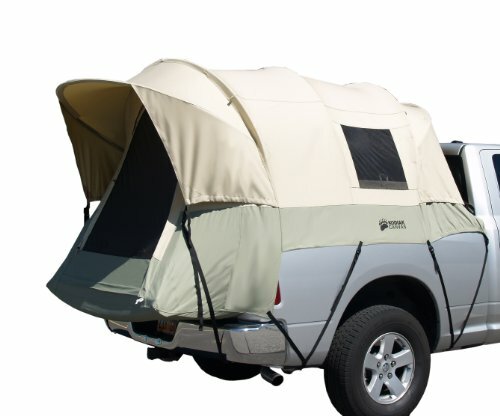 This roomy tent for truck beds provides space for 2 adults. With its 5.6' feet headroom, 2 mesh windows and side vents, this truck bed tent is one of the most comfortable options in our list. It installs without guide ropes, as the 4' x 4' shade awning secures to the tailgate, allowing you for a real quick setup - while the package also contains color coded poles and sleeves, making it even easier to assemble. The peculiarity of Sportz's pickup bed tent is the rear access panel, which grants you access to the truck's cab, in case you need additional storage. Something few other competitors offer. When it comes to the best truck bed tent you cannot exclude Kodiak from the list. 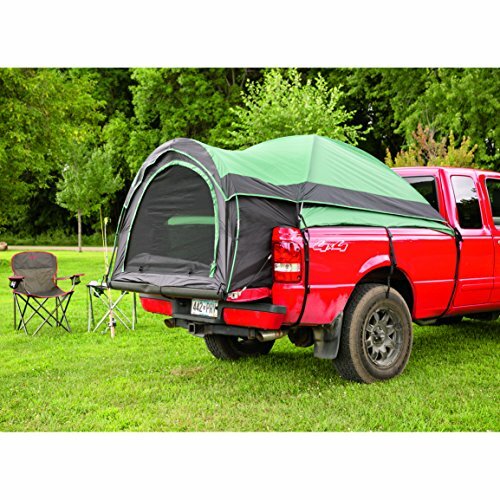 This tent for truck beds comes with high-end durability and a watertight, breathable design. With its 5' feet ceiling height and optional tailgate down design, you will have enough space for 2 adults in your new tunnel shaped pickup bed tent. The secure fit is enabled by the sturdy 3/4-inch steel tube frame, which can be mounted on the truck bed, by connecting it to the clamp-on rails. Kodiak's solution also comes with great ventilation, provided by 5 windows. With this tent for truck beds, you also get the cab access window for extra storage space just like the Sportz Truck Tent. Truck bed tents are a great choice if you want to travel more comfortably in your truck. Even if you are not a camping fan, these top quality tents for truck beds will deliver the comfort that will make you second guess how much fun it can be. You should be on the lookout for quality, weather protection, setup time, and difficulty. All in all, if you go with any of these truck bed tents, there will be nothing keeping you from having a delightful and comfortable experience, while enjoying the view, wherever and whenever you wish.